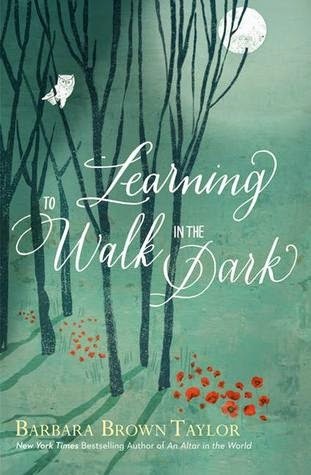 I just finished reading Barbara Brown Taylor’s latest book: Learning to Walk in the Dark. She weaves together metaphors of light and dark, challenging the notion that darkness is dangerous and evil, and examining the physical, psychological and spiritual dimensions of our society’s addiction to light. She wonders what wisdom and knowledge is disappearing because so few of us experience any real darkness. I have never liked the physical dark of night time. I remember being 4 or 5 years old and waking at night and hearing footsteps coming towards me, but being too afraid to call out for my mother, not realizing that those ‘footsteps’ I heard were the beating of my own heart. But why did I think it was something bad that might be coming for me in the dark? Why not something good? I remember being 6 or 7 watching the light move around my bedroom and being afraid, not understanding that it was simply the reflection of headlights from cars on their way down the street. I have wondered if my childish night time fears were because I couldn’t see very well, but that doesn’t explain why I thought something bad would appear. Flash forward more than 40 years; I moved to a small community in Ontario, my bedroom faced the backyard, no streetlights, large trees on a large lot, further away from neighbours than I had ever been. There was little light and my few weeks there I found it difficult to sleep, I may have even slept with the light on. But what was I afraid of? For it was fear that kept me tense, waiting to see what would appear out of the darkness. And just a few months ago, I went on a 3 day silent retreat at Tatamagouche Centre, situated on Tatamagouche Bay, it’s a place full of natural beauty, a place where darkness is possible. A couple of weeks before my scheduled retreat I found out that I would be the only one there overnight as there was no programming that weekend. It’s a large property, away from the town of Tatamagouche and I found myself unable to turn the light off to sleep. Again, what was I afraid of? Because again, it was fear that kept the light on. In the light of day, I cheerfully acknowledge that my fears are unfounded, but as day turned to night, I slept with the light on once more. Despite this fear of physical darkness, I have not been fearful of metaphorical darkness. Somewhere I have learned that expending energy to avoid the dark places in my soul is actually counter-productive; that there is much wisdom to be gained by going into my dark places. Reading this book, I find myself wanting to experience physical darkness, not the semi-darkness of urban and suburban life, but the darkness that is only possible away from urbanity. I will have that opportunity as I head to Tatamagouche Centre this week, although there will be companions this time, perhaps one or two of us will share the deep darkness that is possible there. The Bible is full of metaphors of light and dark; often darkness is portrayed as something bad. A quick word search for ‘dark’ and I find 233 references, another search for ‘darkness’ finds and additional 178 references, most of them negative. Each time I lead worship, a Christ Candle is lit; Jesus is known metaphorically as the Light of the World. And yet, not all references to darkness in the Bible are negative. It is in the darkness that God speaks to Moses. It is in the darkness of the earth that the seed germinates. It is the darkness of the tomb that the resurrection is made possible. Can I begin to see darkness not as something to be feared, but to be embraced? As necessary as light? Can I find the gift in the darkness? What is your experience of darkness?